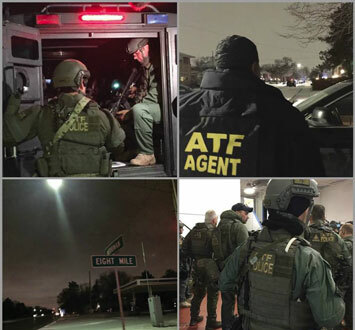 CHICAGO—A research report accusing the Bureau of Alcohol, Tobacco, Firearms and Explosives of plotting drug stash house sting operations that targeted dozens of Black and Latino males for arrest and prosecution is evoking outrage from social justice advocates and attorneys. Young men were recruited by ATF informants and agents and convinced to rob drug houses hoping to reap rich financial rewards. The drug houses never actually existed and neither did the drugs. But being ensnared in the federal scheme meant heavy prison time because of laws that exact harsher punishments for drug crimes—even if the crimes are fake crimes. Sometimes “robbers” had to be given guns by ATF to carry out the fake crimes, or were almost coerced into the robberies—as in the case of a young man who was threatened by an ATF informant with gang retaliation if he didn’t pay back a loan given for a car. The payback was to participate in a drug house robbery. Those ensnared by the ATF often had records as small time drug dealers but not for violent crime. “This is disturbing and provides further evidence of the racial inequities in our criminal justice system—inequities that must be addressed,” said Ed Yohnka of the Illinois branch of the American Civil Liberties Union. Even on the watch of a Black president and Black attorney generals, the ATF’s misdeeds prove historical inequities still exist in U.S. law enforcement and in the criminal justice system, said critics. The comprehensive report, authored by Professor Jeffrey Fagan, was the basis of motions to dismiss charges filed in three federal criminal drug and weapons cases in late September by attorneys with the Federal Criminal Justice Clinic. The clinic represents poor and low income defendants charged in federal crimes and is affiliated with the University of Chicago Law School. Attorneys plan to file motions in seven more cases over the next several weeks. The ATF intentionally discriminated in drug stings by targeting Blacks and Latinos and violated their constitutional rights, said the clinic. Sting targets were arrested and charged with felony drug crimes. While some of the men arrested had prior criminal histories others had little or no criminal record. Of 24 cases involving 94 individuals charged between 2006-2013 in Chicago, the overwhelming majority were Black and Latino. Between 2011-2013 the ATF engaged in nearly exclusive recruitment of non-White persons in these operations, noted Prof. Fagan’s report. 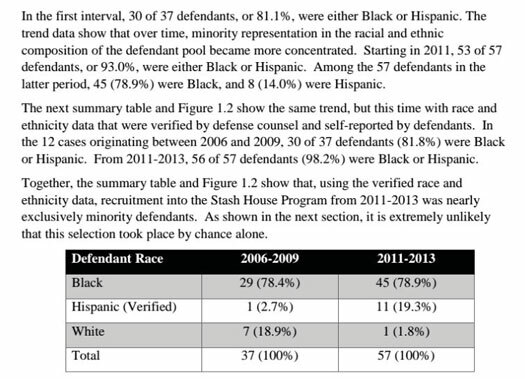 “From 2011-2013, the selection of only one White defendant among the 57 Stash House defendants recruited in that period suggests that Black and Hispanic persons were targeted for selection by the ATF,” the report continued. Of 94 sting targets, eight were White, 12 Latino and 74 Black. Mr. Fagan, a professor of law at Columbia Law School and professor of epidemiology at the Mailman School of Public Health at Columbia University and senior research scholar at Yale Law School, was also instrumental in compiling data from the controversial Stop and Frisk police policy in New York that targeted Blacks and Latinos and was deemed unconstitutional. A long history of nefarious law enforcement conduct? 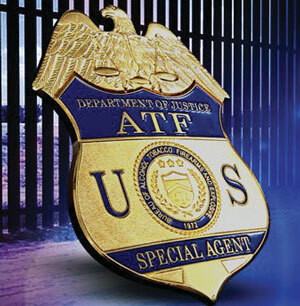 The ATF is the U.S Department of Justice agency responsible for enforcing firearms, explosives and tobacco laws and regulations and protecting communities from violent criminals and criminal organizations. “This has been going on for ages, this type of behavior. I was a former Los Angeles police officer. I worked narcotics, I worked with the ATF. These things have been going on for the longest, this isn’t anything new under the sun,” said Alex Salazar, now an activist with the National Association of Law Enforcement Officers for Justice, Accountability and Reform. As more people become empowered, more problems within policing and criminal justice will be exposed, he said. What made the tactics all the more nefarious was that ATF agents often lied to lure suspects, said activists and lawyers. “The ATF’s Stash House Operation is a wholly fictitious crime that is created, managed, and orchestrated by the ATF for the ostensible purpose of identifying persons and infiltrating groups that ... focus their criminal activities on executing robberies, by means of force, for personal gain,” attorneys argued in court documents. The ATF ignored controls that were supposed to be used in stash house stings, said Chicago lawyers. Each of the 24 cases reviewed included use of the same or similar tactics. But the cases did not comply with ATF internal guidelines for identifying criminals prone to commit violent crimes—and therefore legitimate targets for drug stings. “In this district, the program swept up not the ‘worst of the worst,’ but enormous numbers of poor and vulnerable Black people and other people of color,” court documents noted. These drug cases are especially difficult to win because they are fought at the federal level, said Chicago-based attorney Standish Willis. “I think I’ve had three of these (cases) in the last 10 or 12 years and all the guys went to prison because it was hard to beat them because they were set up by the ATF—and we raised the issue of race. I raised it with various judges but it didn’t go any place because we couldn’t prove it,” said Atty. Willis. “It just didn’t seem like it was something that the government should be doing since people weren’t really doing anything,” said Atty. Willis. War on Drugs, war on Blacks and Latinos? According to the Sentencing Project, half of those incarcerated in U.S. federal prisons are locked up for drug offenses. “Most of these people are not high-level actors in the drug trade, and most have no prior criminal record for a violent offense,” the group notes. In 2014 there were 488,400 people in U.S. prisons and jails for drug offenses, a ten-fold increase from 40,900 in 1980 after harsher sentencing penalties were instituted under the Reagan administration’s War on Drugs. In 1986, people released after serving time for a federal drug crime had spent an average of 22 months in prison. By 2004, sentences had increased three times that length to over five years, 62 months in prison. When drug prosecutions were taken from individual local law enforcement agencies and given to the federal government, a change took place, said Atty. Willis. “During the mid-80’s even earlier we as lawyers begin to see, in particular activist lawyers, begin to see there was something going on in the community and it was unusual. We didn’t know how broad it was,” he explained. Lawyers began noticing the increased penalties for drug crimes. “We’re talking about wars against drugs, wars against crimes, wars against gangs. And this became the rhetoric and it was pretty clear that they were talking about wars against Black youth. Still we couldn’t put it all together but it was pretty clear that something is going on. And it was not just happening in Chicago,” he said. The operation was shut down after 120 days in Phoenix. But other versions of Operation Gideon were attempted. In 2014 California’s 9th U.S. Circuit Court of Appeals denied a hearing that could have allowed a lower court to overturn long prison sentences for four defendants convicted in some of the “more bogus” drug stash house stings. “Dissenting judges argued that the practice of enticing poor young men into robbing stash houses raised questions not only of fair play, but also of constitutionality. The dissenters were particularly concerned that federal agents targeted primarily minority neighborhoods filled with desperate, unemployed young men tempted by the lure of fast cash,” wrote Clarence Walker in an article, “ATF’s Operation Gideon Raises Questions of Fairness, Justice, and Race,” posted on stopthedrugwar.org. 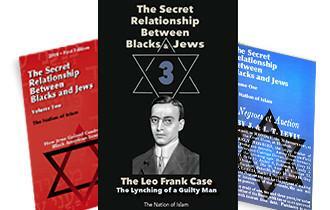 The sting tactics are part of a mass incarceration campaign to imprison Blacks, said Atty. Willis. The ATF has a stereotypical perception that Black communities are crime-filled, crime-oriented and crime-related, said Atty. Lew Meyers, Jr. 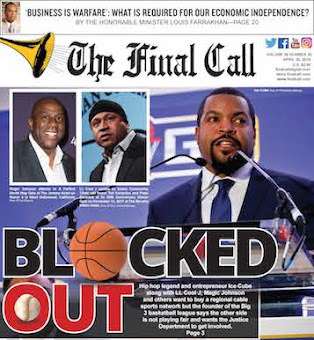 In order to fulfill their mission to regulate and control guns in Chicago, the agency feels it must come to the Black community, which is extremely prejudicial and racist, said Atty. Meyers, who is also a professor of criminal justice at Chicago State University. 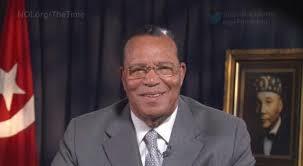 Nation of Islam Minister Louis Farrakhan has warned for decades of the U.S. government’s very real conspiracy to incarcerate Black youth. 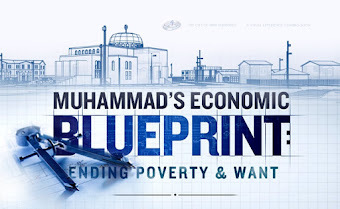 There is no real “war on drugs,” the Muslim leader has pointed out. “This is purposely done, because prison, now, is ‘big business.’ You know, the prison industrial complex is now on the stock market, and the privatizing of the prison industry is going on as we speak. Therefore, just as people don’t build hotels if you don’t expect occupancy, people don’t build prisons unless you expect people to fill those prisons,” the Minister has often warned. The Fagan report only amplifies what lawyers have always known, said Atty. Meyers, who questioned the number of Black agents that work for ATF. “You’re going to find that the great majority of those agents, including in the Chicago field office are White. 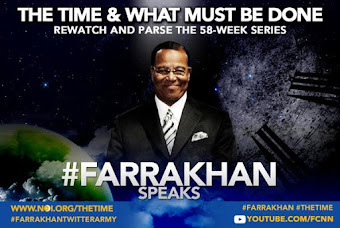 You might also find that the great majority of those agents in the country who are involved in the targeting process and who are involved in the racist policy of the ATF that involves the targeting of the Black community, those people are White,” added Atty. Meyers. He could only recall only one or two times in the last 20 years where he has seen a chief ATF agent that was Black. 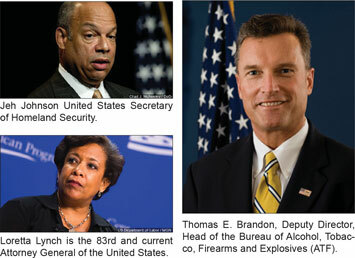 But even in those rare instances, the chief ATF policymakers are White and call the shots, he noted. On Sept. 24, federal prosecutors in Chicago dropped several drug conspiracy charges against 27 defendants with no explanation. There is strong suspicion the decision was connected to findings outlined in Prof. Fagan’s report. Prosecutors didn’t want to be drawn into controversy or be forced to justify any suspect investigations or convictions. 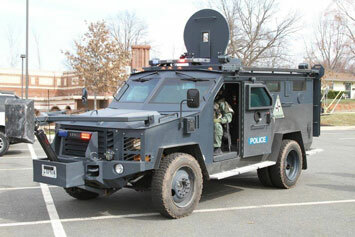 Weapons and other charges against the defendants were not dropped. The Final Call contacted the ATF Chicago field office and received no response. Calls to the ATF headquarters in Washington, D.C., were met with a terse reply: ATF does not and would not comment on ongoing cases, contact the U.S. Attorney’s office. 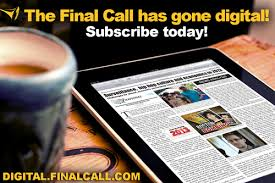 The Final Call called the office of U.S. Attorney for Illinois Zachary Fardon, left a message but received no response. 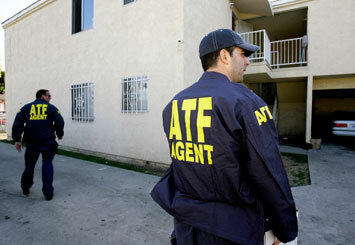 A spokesman from the ATF’s Chicago field office was quoted as denying discrimination accusations. “We don’t see race or ethnicity when we are conducting a criminal investigation,” Thomas Ahern, a spokesman for the Chicago ATF told the Chicago Tribune. “We are not planting that seed,” he said. The ATF’s denial that race is a factor in the numbers of Blacks and Latinos arrested “borders on the ludicrous,” said Atty. Meyers. The statistics in the report defy that logic, he added. U.S. courts, especially at the appellate level do not like and usually will not entertain overturning such cases, Atty. Willis noted. “So we said that if we’re going into the courts and if it gets up on appeal, we have to have very solid statistical basis, otherwise they’ll probably just throw it out. But if we have very solid statistical basis, especially with this guy (Prof. Fagan) who we hired, then it will be more difficult for them to throw it out. And if they throw it out then we will go to the Supreme Court,” said Atty. Willis. He believes judges in some pending cases will grant new trials. U.S. attorneys can appeal that decision but the appellate court is likely to be cautious, he said. “They know the next step will be taking it to the Supreme Court and we’ll have a much better chance in the Supreme Court because it’s a national issue now,” he argued. 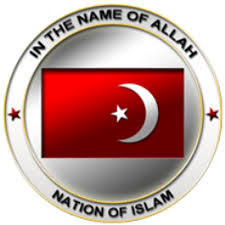 The government would love to have you believe these are isolated incidents, but unfortunately they are not, he added. Atty. Meyers agreed. Attorney General Lynch and Jeh Johnson, head of Homeland Security, must intervene and assess what is happening. While he hopes there will be significant changes after this latest report, Mr. Salazar is not overly optimistic. “Until the log is removed out of their eyes and it’s made very glaring like with this report, they usually don’t do anything and before, that’s exactly what it’s been. The world has known that this type of behavior happens,” said Mr. Salazar. It is ironic that much of the ATF action occurred under President Obama’s watch, said Atty. Meyers. “Eight years later, we’re still being confronted by systemic problems of racism in the criminal justice process and, in general, agencies involved in the criminal justice process. I’m not so sure that that might not be a drag on whatever good will that our president leaves office with in 2017,” he said.